Unilin Distribution Ltd (Greenbank Ind Est, Newry) are delighted to present a cheque to PIPS Newry & Mourne. Funds were raised by employees who took part in the local Oktoberfest 5K race and all money raised was matched by the Company to present a cheque for £800. Unilin Distribution is the main distributor of all Quick Step and Elka products throughout the UK and Ireland. The Company wanted to give something back to the community and felt they could help make a difference to people's lives through PIPS, an organisation close to so many people's hearts. Employees were only glad to take part in something so small that could make such a difference in helping others. 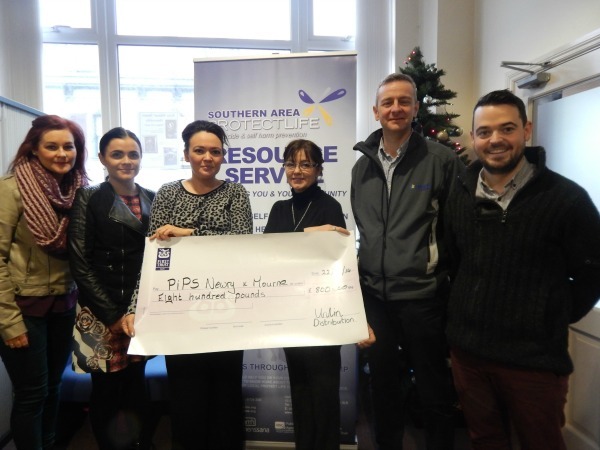 Pictured are members of Unilin Distribution presenting a cheque to Dympna Maguire of PIPS Newry & Mourne. PIPS Newry & Mourne would like to thank all the employees for their very kind donation to our organisation, it is very much appreciated.